The Siberian Husky (Russian: ????????? ???? ?, Sibirskiy haski, "Siberian husky") is a medium-size, wolf-like, dense-coat working dog breed that originated in eastern Siberia. The breed belongs to the Spitz genetic family. It is recognisable by its thickly furred double coat, sickle tail, erect triangular ears, and distinctive markings. In 1930 the last Siberians were exported as the Soviet government closed the borders of Siberia to external trade. The same year saw recognition of the Siberian Husky by the American Kennel Club. Nine years later the breed was first registered in Canada. Today’s Siberian Huskies registered in North America are largely the descendants of the 1930 Siberia imports and of Leonhard Seppala’s dogs. Seppala owned a kennel in Nenana before moving to New England, where he became partners with Elizabeth Ricker. The two co-owned the Poland Springs kennel and began to race and exhibit their dogs all over the Northeast. As the breed was beginning to come to prominence, in 1933 Navy Rear Admiral Richard E. Byrd brought about 50 Siberian Huskies with him on an expedition in which Byrd hoped to journey around the 16,000-mile coast of Antarctica. Many of the dogs were trained at Chinook Kennels in New Hampshire. Called Operation Highjump, the historic trek proved the worth of the Siberian Husky due to its compact size and greater speeds. Siberian Huskies also served in the United States Army's Arctic Search and Rescue Unit of the Air Transport Command during World War II. A sable colored Siberian Husky. Siberian Huskies share many outward similarities with the Alaskan Malamute as well as many other Spitz breeds such as the Samoyed, which has a comparable history to the Huskies. They come in a variety of colors and patterns, usually with white paws and legs, facial markings, and tail tip. The most common coats are black and white, copper-red and white, gray and white, pure white, and the rare "Agouti" coat, though many individuals have blondish or piebald spotting. Striking masks, spectacles, and other facial markings occur in wide variety. They tend to have a wolf-like appearance. Facial masking is common in the husky. A red/white colored Siberian Husky with heterochromia, a trait which is unusual in most dogs, but common among Siberian Huskies. The American Kennel Club describes the Husky's eyes as "an almond shape, moderately spaced and set slightly obliquely." The eyes of a Siberian Husky are ice-blue, dark blue, amber, or brown. In some individual dogs, one eye may be brown and the other blue (complete heterochromia), or one or both eyes may be "parti-colored," that is, half brown and half blue (partial heterochromia). All of these eye color combinations are considered acceptable by the American Kennel Club. The Siberian Husky's coat is thicker than that of most breeds of dogs, comprising two layers: a dense undercoat and a longer topcoat of short, straight guard hairs. It protects the dogs effectively against harsh Arctic winters, but the coat also reflects heat in the summer. It is able to withstand temperatures as low as ?50 °C to ?60 °C. The undercoat is often absent during shedding. Their thick coats require weekly grooming. Long guard hair is not desirable and is considered a fault. Siberian Husky puppy (one and a half month old). Show-quality dogs are preferred to have neither pointed nor square noses. The nose is black in gray dogs, tan in black dogs, liver in copper-colored dogs, and may be flesh-colored in white dogs. In some instances, Siberian Huskies can exhibit what is called "snow nose" or "winter nose." This condition is called hypopigmentation in animals. "Snow nose" is acceptable in the show ring. Siberian Husky using her tail to keep her nose warm on a cold winter night. Husky tails are furry and fluffy in order to provide warmth for their face and nose during cold winter nights. Huskies are also known for their uniquely identifiable "curled" or "sickle" tails. The breed standard indicates that the males of the breed are ideally between 21 and 23.5 inches (53 and 60 cm) tall at the withers and weighing between 45 and 60 pounds (20 and 27 kg). Females are smaller, growing to between 20 to 22 inches (51 to 56 cm) tall at the withers and weighing between 35 to 55 pounds (16 to 25 kg). Siberian Husky playing in the snow and exhibiting a "curled" tail. The Siberian Husky has been described as a behavioral representative of the domestic dog's forebear, the wolf, exhibiting a wide range of its ancestors' behavior. They are known to howl rather than bark. If the dog is well trained it can make a great family pet. The frequency of kenneled Siberian Huskies, especially for racing purposes, is rather high, as attributed through the history of the breed in North America. They are affectionate with people, but independent. 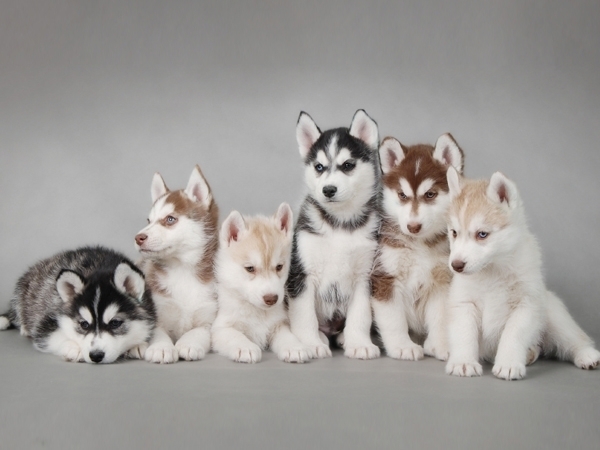 A fifteen-minute daily obedience training class will serve well for Siberian Huskies. Siberians need consistent training and do well with a positive reinforcement training program. They rank 45th in Stanley Coren's The Intelligence of Dogs, being of average working/obedience intelligence. They tend to run because they were at first bred to be sled dogs. Owners are advised to exercise caution when letting their Siberian Husky off the leash as the dog could be miles away before looking around and realizing their owner is nowhere in sight. They are excellent "escape artists" as well and have been known to climb chain-link fences and find other ways of escaping a confined area. They also get bored easily, so playing with toys or throwing the ball at least once a day is essential. Failure to give them the attention or proper exercise they need can result in unwanted behavior, such as excessive howling, marking, chewing on furniture, or crying. Siberian Huskies are highly intelligent, which allows them to excel in obedience trials, though many clubs would like to keep the Husky's instinct by doing sled-racing. However, because of their intelligence, they can easily become bored and may stop listening to commands. Many dog trainers usually attempt to avoid this behavior by keeping them busy with new activities. Also due in part to their intelligence, Huskies tend to be very observant on the actions of people around them and have been known to mimic common household activities such as turning on lights with their paws and opening doors with their canines. Some undesirable behaviors they can exhibit include opening refrigerators (and eating the food inside), climbing fences or digging tunnels in the backyard to escape. These behaviors can be prevented if the dog is given enough activity to occupy it. Huskies require both mental and physical stimulation for optimum health.